CBSE News Today: Half of class 12 students got more marks after re-evaluation. Total 4,632 answer sheets required corrections after re-checking out of 9,111 total objections raised. Following this, the response will be hiked against a total of 214 teachers of various CBSE affiliated schools for a colossal lapse. Besides, because of re-evaluation procedure, a new topper of Nagpur region, Ishrita Gupta of Class 12th Central Board of Secondary Education captured the headlines today. It’s clear that because of a burden on evaluators there is a room of improvement in the existing ratio. Although, 55 and 81 teachers/ evaluators of Allahabad and Dehradun regional offices respectively are already being inquired. Yet, 0.4% fault rate can also be improved a bit, which is already at all-time-low. Is CBSE’s two-stage selection process successful? Re-evaluation process does not include the word-to-word rechecking of written answers. Rather, just marks are calculated once again keeping section wise marking scheme in mind. And, for successful implementation of this facility, re-evaluation is now done at two stages i.e. each and every copy of students’ who raised the objection are checked twice by a different person. 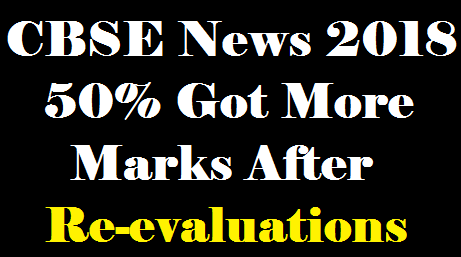 K. K. CHOUDHURY, CVO and other officials of Board of Controller of Examinations have reported the curtailed error rates because of two-stage evaluation procedure of CBSE Board. Statistical data for session 2016-17 was not unveiled by CBSE. While in the last session, re-evaluation procedure took too much time as proceedings were carried on depending on Delhi High Court decision. Giving zero marks for right answers and calculations incorporating errors were major issues observed after analyzing the CBSE’s this year re-evaluation reports. Tripathi has also stated that CBSE will continue its efforts to improve and re-evaluation process can be restructured again if needed. Candidates could apply for re-evaluation only after seeking retotalling & copy of their answer sheets. Concluding that, in the session 2018-19, 99.6% answer sheets have been correctly scrutinized. And, remaining updates of next session 2019-20 board examination acquire conveniently on ALL INDIA ROUNDUP.